With the cold weather coming up, this black-eyed pea curry can be enjoyed by itself or garnished with avocados, cheese, or yogurt. It is rich in fiber, iron and anti-inflammatory turmeric & ginger. The almond meal in this version gives it extra creaminess along with added fiber, heart-healthy monounsaturated fat and protein. 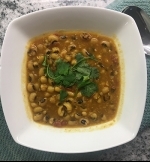 Also great, black-eyed peas don’t require soaking like other beans and lentils. I made these in my Instapot for quick week-day dinner. Soak the peas for 1 hour if you have time. Throw soaking water away before cooking (this helps the digestibility of the beans). Once hot, add the oil and then the cumin seeds. Add ginger, garlic and stirfry; cover for 3 minutes. Continue cooking on less heat setting for 10 minutes. Add the peas along with 4 cups of water. Set Instapot on “Manual Pressure” mode for 20 mins. Once open, add almond meal to warm water and mix into curry. Add garam masala at the end and optional garnish with chopped cilantro.